While a civil engineer by trade, Steve Choi always had a natural talent in working with his hands, and a strong affinity for creative arts. Throughout university, he had taken up oil painting, as well as designing clothing for his then girlfriend and now wife. Even after taking up a fast paced jobs in Hong Kong and Canada, he still devoted time on woodworking to channel his creative outlets. On happenstance, he came across a Korean pottery demonstration put on by Master Kim. He became captivated by the technique and the art, and had become Master and Mrs. Kim's first group of students. With his innate talent, Steve quickly became the prominent student, absorbing all that the Kim's had to teach of Korean pottery. 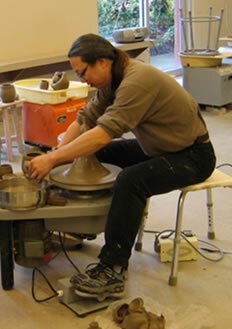 In the spring 2004, Master Kim expressed that it is time for Steve to share the art with others. "What continues to fuel my fascination and devotion to the art is how the intricacies and challenges along each step of the creation process all tie in together to produce a unique piece of art. From wheel throwing to trimming, inlaying and carving to decorating, and glazing to firing, the skills involved in each step are distinctive, and attaining mastery of the art requires the mastery of every step along the way."